BIG & SHINY & SCARY & PRETTY! The combined talents of our artist Kevin O'Hare and master pewtersmith Randal Moore have created The Wind Dragon, arguably their best dragon sculpture yet! 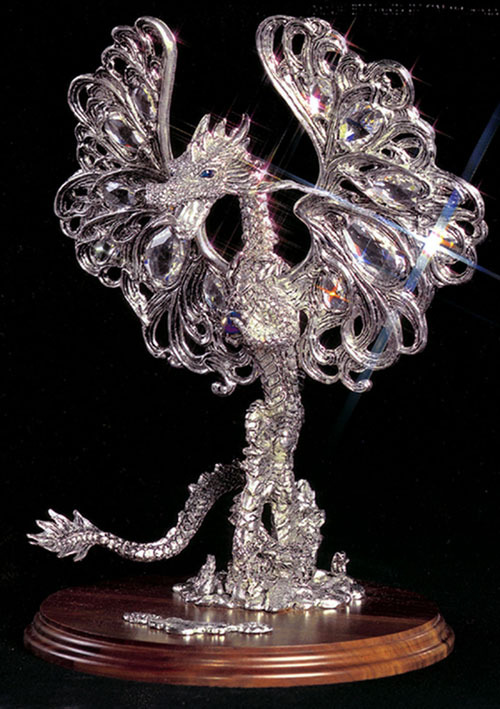 Molten pewter has been poured around Austrian chandelier crystals to give this dragon his 12" wingspan. He has deep blue eyes, and clutches a crystal ball to his chest as he flashes his long forked tongue. This statue is a limited edition of 750, and each is hand signed by Kevin O'Hare on an engraved plaque, and mounted on a hardwood base. An individually numbered and signed Certificate of Authenticity accompanies each sculpture.